"As with many DK productions, Timelines of Everything succeeds due to its visual inventiveness"
"Timelines of Everything is an imaginative way of illustrating history for children aged eight and over, linking disparate facts and events and telling the story of subjects as diverse as dance and slavery in an easily digested graphic format." "There are loads of amazing photos and illustrations - just like you'd expect from a DK Book!" "Whether you'd prefer to learn about the history of cinema or fashion, aviation or espionage, you're certain to find something for you in this fascinating guide to global history." Explore an illustrated history of the world through timelines for kids. From dinosaurs and Vikings to the history of film and espionage, discover incredible world history in this lavish collection of timelines. More than 140 timelines give you all the general knowledge you need--and even some surprising trivia you don't! Must-know topics and alternative history are showcased with beautiful, detailed illustrations and straightforward, easy-to-read text. Whether you want to know key breakthroughs that set the Industrial Revolution in motion or defining moments in the history of fashion, you'll find it all here. 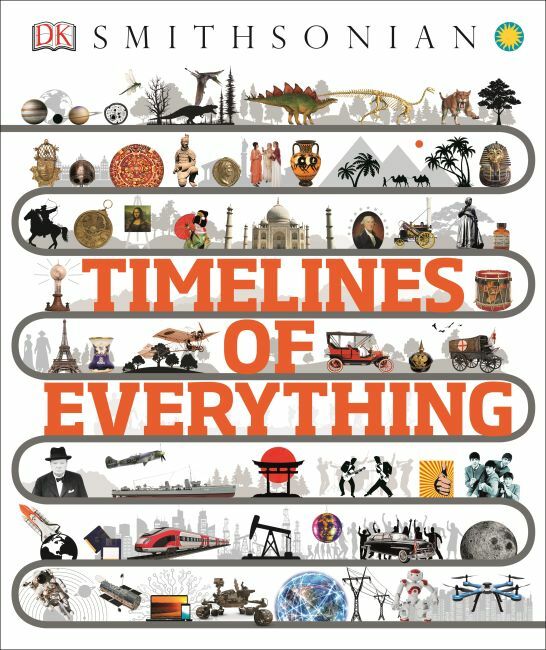 With timelines on a diverse range of subjects, Timelines of Everything is the ultimate guide to history for kids.